I was instantly drawn to this book because of its title, which no doubt invokes plot possibilities involving American obesity, type 2 diabetes, dieting, weight loss, and all other facets related to being overweight or obese. Since obesity, weight loss, and bariatric surgery are some of the dominant key topics I write about professionally as a medical and health writer, I decided to buy this book after the synopsis informed me that one of the main characters undergoes gastric bypass surgery. 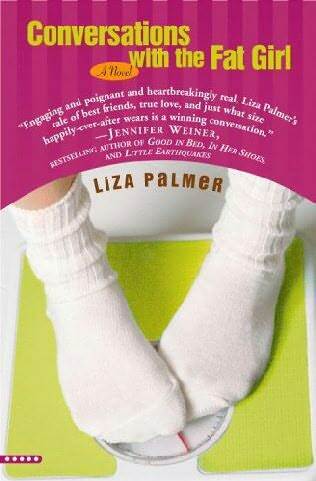 According to Liza Palmer's author description on Fantastic Fiction, Conversations with the Fat Girl has become an international bestseller since its publication. Conversations with the Fat Girl revolves around the life of Maggie - an upbeat though very self-conscious 27-year-old who allows her weight to control her life and impact the way she interacts with other people. Her lacking self-confidence is even evident in the way she handles her professional career (or lack thereof), since Maggie is letting her artistic talent and masters degree in museum studies go to waste while she spends her days earning just over minimum wage at a local coffeehouse. Maggie's best "fat" friend from elementary school named Olivia is now engaged and lives on the other side of the country with her fiance - a handsome and successful bariatric surgeon who has no idea that the now-skinny Olivia was once as overweight as Maggie. As Maggie helps Olivia prepare for her wedding as the maid-of-honor, Maggie begins to realize that she is letting her feelings about her weight get in the way of enjoying life in general. She also realizes that being skinny doesn't always result in happiness based on the way Olivia and her new group of "skinny" friends constantly behave. Maggie then sets out with the goal of improving her life and her health without letting it change who she really is on the inside. Conversations with the Fat Girl is nothing like I thought it would be - it was much better! I was initially prepared to read about an overweight woman who spends the entirety of the book lamenting about being fat and about her endless feelings of jealousy toward thinner, healthier people, but this wasn't at all the case. Maggie has a wonderful and humble personality, and you can't help but feel sorry for her when you realize just how down in the dumps she is for being overweight and feeling like there's nothing she can do to become healthier. Conversations with the Fat Girl is a story about how a woman comes to realize on her own that she is failing to live life to the fullest, and already knows what she must do to make it better. When Maggie finally starts to make the transition to becoming healthier, I was extremely pleased and proud of Maggie for introducing exercise and healthier foods to her diet as opposed to taking the lazy way out with bariatric surgery like Olivia had done. I'm glad that Palmer has Maggie make smart and healthy decisions, which sends out the most positive message to readers, especially those who are overweight or obese. I also love when Maggie's personal gym trainer informs her that he doesn't care about seeing her "fat area" when she does certain exercises. In reality, it's true - most fitness professionals don't care about a person's "fat areas" because they already know that the person is taking steps to becoming more fit and healthier by exercising in the first place! Kudos to Palmer for that side-plot bit. Lastly, I think Palmer is a genius for letting readers form their own interpretation of Maggie's size, since Palmer never reveals Maggie's pants or dress sizes. Very, very clever. I loved Conversations with the Fat Girl, and enjoyed my time with the book so much that I read it straight through without stopping, never wanting it to end. When the book finally did end, I initially felt that the conclusion was abrupt, but decided it left the reader happily pondering how Maggie's life would become better. Overall, this novel is very charming. You do NOT need to be a "fat," overweight, or obese person to enjoy this book. It's cute, funny, and very heartwarming. Other novels by Liza Palmer include Seeing Me Naked, A Field Guide to Burying Your Parents, More Like Her, and Nowhere But Home. Have you read any books recently that involved characters who were overweight or obese? If so, share the names of the book titles below, as well as your thoughts about them.